28 Today's Veterinary Business Communication Over the last few years, na- tional trends show decreasing transactions and fewer new clients. What can be done to metaphori- cally bring the V-tach back to some sort of predictable rhythm? In one word: marketing First off, we need to recognize that we cannot predict or create sick pets. Variation from day to day, week to week and month to month is more of a case of con- trolling well-care visits. Second, re- alize that new-client transactions are less controllable if you lack an aggressive and expensive market- ing campaign, and even then, you need a compelling call to action for a pet owner to become a client. Finally, understand that you have a computer or file cabinet full of existing clients who are beg- ging for more information about how to better care for their pets. Remember when February was the shortest month of the year? Now, in veterinary practices, February is what? I hear you: It's National Pet Dental Health Month. (Thank you, Hill's Pet Nutrition.) Remember when February was the nadir of your bell-shaped curve? After we focused on dental care and did some imaginative marketing, our dental care revenue and service numbers peaked in February, pushing up that point in the revenue curve. Did clients' pets have dental needs the rest of the year? Absolutely. We just focused on dental care and — voila! — Feb- ruary was no longer a lost month. How many of you have Heart- worm Month? You do 80 percent of your heartworm testing and prescribing that month. Are pets at risk the rest of the year or just that month? We focused on getting cli- ents in during Heartworm Month. A Four-Step Process To smooth the ups and downs: • Create a 12-month education program addressed to a se- lect portion of your clientele. • Start a breed-specific market- ing program to help certain pet owners understand the risks to the breed. • Initiate an ongoing internet marketing program that focuses on education. 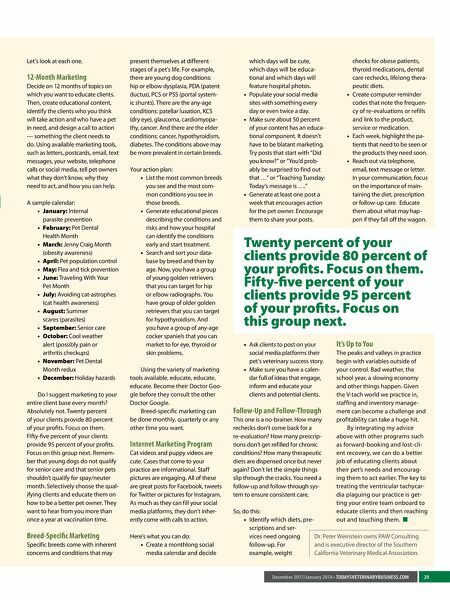 • Conduct follow-up and fol- low-through marketing. Not too long ago, small animal veterinary medicine had a predictable seasonality. From a revenue and transactional standpoint, it looked like a bell-shaped curve — the peak usually in midsummer, the valley in winter and the curve heading up in spring and down in fall. That is no longer the case. Today, the curve looks more like a case of ventricular tachycardia, with the best month ever sometimes followed by the worst month ever. 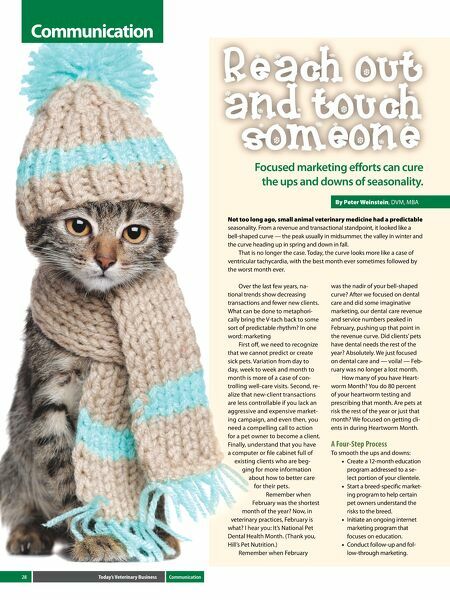 Communication By Peter Weinstein, DVM, MBA Focused marketing efforts can cure the ups and downs of seasonality.